Periodical RV coatings are essential to maintaining your roof in good health. Coatings have become essential to protect your vehicles from the damage it is subjected to on the road. Coating your RVs have various benefits. Firstly, it extends the life of your roof and RV in general. Protecting your roof means protection against leakages, molds, and cracks. It will not only save you money and time but also make sure that your trips are carefree. Why Use Roof Coatings for RV? RV coatings have many benefits. They protect your roof from any potential damages due to rain, snow, ice, hailstones, as well as debris. Coating your RV roof also leads to increased protection against detrimental leak related damage by sealing all the leaks on your roof. If you own a travel trailer you would know that the RV roof is the most damage-prone area of the RV. The roof is constantly subjected to UV rays, hail storms, strong winds, and rains, while it protects everything inside including you. These factors can make your roof wither and degrade. It may, and eventually will lead to a number of problems including cracks, leakages, damage due to debris, etc. Areas of the roof can also sink causing ponding water over your RV. Roof repair coating can protect your RV against all this. Coating the roof of your RV will not only create a waterproof barrier, but it will also seal off any cracks or leaks on the roof that may have developed over time. In preventing further damage, it also extends the lifespan of your RV. Repairing damages like leaks can be fairly expensive. If not looked at in time, it may require you to replace the entire roof. Roof coatings for RV is a cost-effective method that saves you the time and trouble of going through the roof replacement. Using an RV coating on your roof will save you money in the long run. EPDM Coating for RV- What are its Benefits? Rubber Roof Coating for RV- What are its Benefits? 1. Why do I need to get a Roof Coating for my RV? 2. 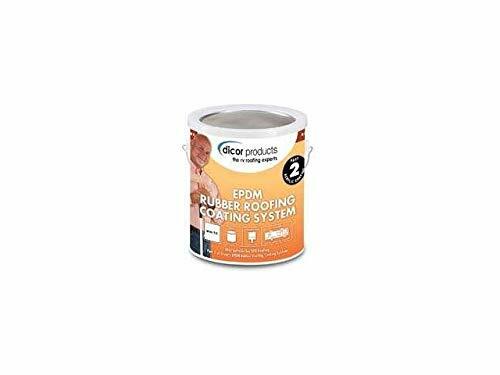 How Long does a Roof Coating Last for? 3. 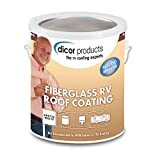 Do I need a Primer to Apply the Coating on my RV Roof? 4. How much Time should I Allow Between Different Coats? 5. Can I use a Thinner or Spirit to Clean the Previous Coating? The key parameters for deciding the coating for your RV roof includes reflectivity and elasticity, the durability of the material, and its capacity to resist rain and water-related damage. The prelevant weather also affects the choice of coating. The compatibility of the substrate material of your roof with the coating material is important. Cost is a major concern for almost everyone no matter what you are buying. If your budget is on the lower side, you can go for an acrylic coating for your RV. Acrylic coatings are cost effective and do their work well. Silicone coatings are the most expensive of all options available, while urethane coatings are mildly expensive. Reflectivity is an important attribute for the RV coating. It prevents your RV from getting heated up, thereby increasing its lifespan. It is also an important factor in decreasing thermal shock. Decreased thermal shock makes a vehicle impact resistant. While urethane and acrylic coatings retain their reflectivity for longer, silicones coats may lose reflectivity up to 45% very soon. This leads to increased damage to your RV. Though it is true that acrylic is the more inexpensive coating, using acrylic requires you to put 2 coats. Additionally, you will need a primer and a fabric reinforcer to work with it. This naturally drives up the per project cost. Silicone and urethane being more expensive, do not require these additional efforts. They are easy on both your time and effort. Silicone requires one coat while urethan requires two coats. You will be taking your RV to different areas and subjecting it to various climatic conditions. Water can cause major damage to your RV. Once it seeps into the walls, it can be the reason behind molds. You must look for a coating that is well protected against water if it is likely that your RV will be subjected to rains. When subjected to ponding water, acrylic coatings can degrade and peel off, causing further damage. Both silicone and urethane are well protected in situations of water pooling. Temperature variations are bound to make your roofing material expand and contract. You need to make sure that the coating material you use is flexible enough to accommodate these changes. Both acrylic and urethane based coating materials are flexible. However, silicone’s elasticity is less when compared to the two. A silicone-based coating may crack or even peel when subjected to expansion or contraction.If you know where you are headed, you should make your choice accordingly. One of the foremost factor while deciding on RV coating is to know the compatibility of your roofing material with the substance being used. These coatings are mostly compatible with various roof types. When applying silicone on an EPDM or TPO based rubber roofing, you might have to use a primer to ensure proper adhesion. Coating your RV roof is an enormous task. Using a durable coating can ensure a more long-lasting coat and save you the time and effort of doing it again and again. Silicone-based coating boasts of the highest durability. If you go for acrylic however you might have to recoat more often. Urethane is more durable than both acrylic and silicone. Not all coatings are suitable for all kinds of temperature. Some might crack or peel when subjected to extreme temperatures or even rain. If you are bound to take your RV out in the rain or in extremely cold places, it is recommended that you avoid using acrylic based coatings. Acrylic is a water-based coating and works best in warmer weather conditions. If subjected to freezing temperature, it may trap frozen water and create cracks in your roof. This will also lead to moisture seeping in. While silicone is weather and wind resistant and has great tolerance towards temperature fluctuation, urethane may not work best in wet conditions. In order to ensure the effectiveness of your roof coating, it is necessary to keep certain things in mind. The roof needs to be thoroughly cleaned and dried before you begin the application. It is important to repair any leaks or cracks on your roof prior to the application of the coating. In order to ensure that your roof coating is done perfectly, you will have to be careful about prepping the roof for the process, as well as about other details. Thoroughly clean and dry your roof before beginning to apply the coating. In case you find any cracks, leaks, or gaps on the roof, be sure to fill them or patch them. Check around the openings, vents, and skylights for potential gaps. After their patching is done, you can begin coating. You should begin coating only when it is dry and sunny. It will help in drying and curing the coating quickly. Avoid coating during, or immediately before or after rainfall. Times of dew, frost, or cold nights, should also be avoided. Be sure to roll over the coat on your roof only once at a time. Doing it more than once, or messing with the roller will spoil the coating by making it inconsistent. Begin to put the second coat only after the first coat has thoroughly dried. There are many benefits of using an EPDM coating for RV. They provide automatic leak repair to your RV, preventing any detrimental leak leading damage. EPDM coatings are also weather resistant and provide protection from UV rays and hailstorms. Additionally, the highly reflective property of EPDM coatings provides increased insulation. EPDM coating is a type of synthetic rubber membrane that comes in liquid form. It is known for its elastomeric properties. EPDM RV roof coatings have many benefits. EPDM coatings provide automatic leak repairs on your roof. Because of its liquid form, it slips into the gaps and leaks on your RV’s roof and seals them. The coating becomes waterproof immediately on its application even though it may take a while to dry up. EPDM coatings are known for their extreme durability. They are weather resistant and can endure any weather within its estimated lifespan. They can also withstand hailstorms. The added layer of coating further provides increased insulation. Additionally, it is resistant to moisture. Moisture resistance ensures the molds and mildew do not flourish, thereby keeping your RV safe from internal damage. EPDM coatings also have high reflectivity. This makes them resistant to UV rays. They reflect the heat back, lowering the temperature inside the RV, while also protecting your roof from possible damage from the Sun. There is an ease of application associated with EPDM coatings. While most other types of coating require a primer for proper adhesion, EPDM coatings do not need one. Rubber roof coatings are synthetic rubber membranes that come with various benefits. In addition to providing excellent insulation, they are completely waterproof. Rubber is naturally resilient as well as fire resistant, factors that contribute towards elongating the life of your RV. The flexible nature of rubber coatings adds longevity and durability. There are two kinds of rubber roof coatings available in the market- TPO coating and EPDM coating. They are both synthetic rubber membranes that facilitate longevity and durability in your RV roof. Rubber roof coatings commonly come in liquid form, also known as liquid rubber, and have various benefits.Rubber roof coatings are known for their highly reflective property. This means that the Sun rays are reflected away from your RV, thus making them resistant to UV rays as well as any other damage caused by the sun. Additionally, the high reflectivity of rubber coatings also provides excellent insulation. By preventing the transfer of temperature through the roof, rubber coatings ensure your safety during temperature fluctuation. Their flexibility further ensures that they do not crack or tear when exposed to extreme temperature. Rubber is naturally resilient to damage from outside. Whether it is hailstones or flying debris, all of it bounces back when it comes in contact with the rubber. Thus lowering the impact of objects on your roof. This means that your roof will be protected from any kind of external damage. Rubber coatings are also completely waterproof. Waterproofing your RV roof with the use of rubber coats implies fewer or no instances of leaks, and a reduced risk of rust formation. By not allowing any moisture inside your RV, rubber coatings prevent the growth of molds. Rubber is also fire resistant. 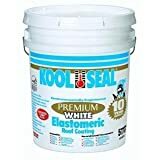 This comes as an added advantage when going for a rubber coating for your RV roof. There are two types of coatings used on a fiberglass roof – gel coat and acrylic paint. While the gel coat involves an easier application and time and cost-effectiveness, acrylic paint provides stronger adhesion. Acrylic paints form a nonporous surface preventing the growth of algae, as opposed to the porous surface of the gel coat. Fiberglass roof RVs are high on demand because of its durability and lightweight. Fiberglass roof can withstand fluctuating temperatures but is still susceptible to water damage and sun damage. An added layer of coating will provide protection against these potential damages and add to the lifespan of your RV. There are two kinds of coatings that are usually applied on a fiberglass roof RV, both with their advantages and disadvantages. They are gel coat and acrylic paint. The application of gel coat is easier and can be done using a spray gun, painting brush, or roller. The gel coat does not take long to dry, and a second coat can be applied within a few hours. Gel coats usually provide a thicker membrane than acrylic paints thereby improving insulation. The thickness also improves the roofs endurance against wear and tear. Acrylic paint, on the other hand, demands a more lengthy process. You are required to first use a primer and sandpaper to level out the surface of the roof. After this prep, you can apply the acrylic paint with the use of either a brush or a roller. It mostly only requires 2-3 coatings to do the work. Acrylic paint provides better adhesion to the surface and is more long-lasting than gel coat. Acrylic also forms a solid surface on your RV roof, preventing any moisture to get into your RV. This inhibits the growth of mildew and algae. Gel coating, on the other hand, forms a porous surface and might result in moisture seeping in. The gel coat can develop hairline cracks due to stress exposing the fiberglass to moisture and weathering. The two most commonplace coatings recommended for metal roof RVs are aluminum and elastomeric coatings. Paint based coatings are not recommended for metal roofs as they may result in erosion and delamination when subjected to snow or ice. RVs with a metal roof are becoming fewer and fewer with the advent of technologically advanced roofing materials like fiberglass. Metal roofs are less expensive and convenient to install and are hence still in demand. Metal roofs are susceptible to the danger of rusting, especially if they are often exposed to rains or snow. The older they get, the more severe this problem becomes. Rust can lead to further damage to the metal roof including holes and reduced endurance of the roof. Providing an extra coating to your metal roof can save you from these potential dangers. There are two types of coatings that are known to be compatible with a metal roof RV- aluminum and elastomeric coatings. The aluminum coatings are usually asphalt based. Aluminum coatings help in preventing rust and provide longevity to the roof. However, the presence of asphalt can make it brittle when subjected to heat-induced contraction or expansion. Elastomeric coatings are better suited to accommodate such contractions and expansions. Their flexibility allows for the movement of metal when subjected to heat, and prevents it from creaking or tearing apart easily when subjected to extreme temperatures. Acrylic based coatings are usually not recommended for a metal roof, and must only be used when it is elastomeric. The lack of elasticity can make any paint based coating to delaminate from a metal roof when subjected to snow or ice. Acrylic based coating on a metal roof can easily lead to erosion due to weathering. Coating your roof extends the life of your RV in numerous ways. In addition to providing additional protection to the roof, it also seals the leaks and prevents and internal damage. Moreover, it makes your roof UV and weather resistant which proves to be an added advantage. Most roof coatings last for 10-30 years. Silicone coatings are known to last for 50 years. But the time may differ from product to product. The durability of the coating also depends on factors like exposure to extreme weather and other conditions. There are coatings that can be applied without a primer. However, if your roof if badly damaged or worn out, using a primer will be a good idea. The primer should be applied after a thorough cleaning and before the coating. It will provide strong adhesion as well as extra protection. If you plan on applying more than one coat, you should maintain a gap of at least 24 hours. The second coat can only be applied after the first one has dried up. In warmer weather conditions, it may take less time to dry. In such situations, two coats may be applied within 24 hours. It is usually recommended that you do not use a thinner to clean the previous roof coating. They may damage your roof. If they remain on the surface while applying the fresh coating, they can lead to peeling and blistering. This can result in a shorter lifespan of the coating. Proguard coatings became operational in the 1950s, specializing first in paints and then in the production of coatings. In the 1990s they developed a unique EPDM based rubber coating for roofs. 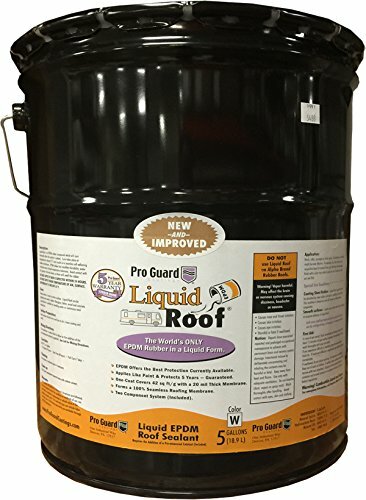 The Proguard F99911 LIquid roof gallon is an EPDM coating that comes in liquid form. The product provides a 42-46 sq ft coverage and weighs approximately 9.75 pounds. One coat of the Proguard F99911 liquid roof gallon covers approximately 10.5 sq ft area with a 20 mil thick membrane. It comes in white color. It provides roof protection for at least 5 years. The application is very convenient. It provides good insulation to the RV. It provides a shiny finish. It may lead to bubble after application. It does not work properly without a primer. Heng’s industries is a supplier of RV and marine products. They operate across the United States and Canada. 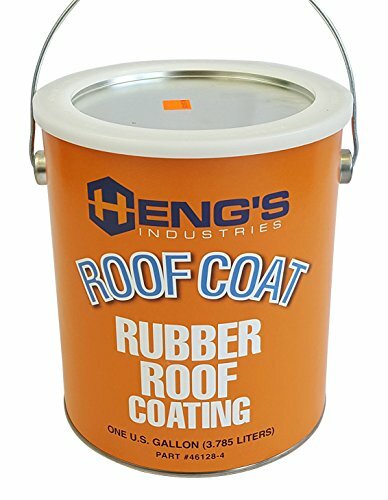 Heng’s rubber roof coating is available in gallon sizes and weighs 5 pounds. It provides a 200 sq ft coverage per gallon and is available in white color. This product provides strong adhesion to rubber roofs. It is UV resistant and can also withstand impact. The application is easy and time efficient. It may start to flake after a few years. The adhesion may not be very strong. The Dicor corporation has been a supplier for the RV industry, especially roofing products, since 1984. Its RPCRC1 RP-CRC-1 Rubber roof acrylic coating comes in white color and is suited to all types of rubber roofing. 1 gallon of these products provides coverage of 125 sq ft. The products itself weighs 12 pounds. Coating your roof with rubber roof acrylic coating leads to reduced roof rumble. It is also extremely flexible. It is absorbent in nature and may absorb the discoloration moisture from your roof. The coating is very thin. Proguard is a leading manufacturing company for EPDM liquid rubber coating for roofs. They manufacture heat and chemical resistant coatings. 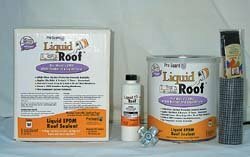 Liquid roof RV roof repair provides an area coverage of 42 sq ft/ g with a 20 mil membrane thickness. It is highly reflective and also has long-term flexibility. It is also protected against adverse weather conditions. This product comes with a 5-year guarantee. 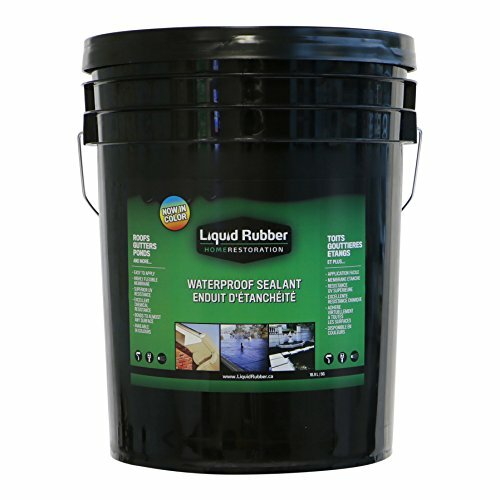 This liquid EPDM coating becomes waterproof immediately on application. It can also withstand standing water. The product weighs 50 pounds. Dicor is one of the most popular providers of roofing products for RV.They have been manufacturing roofing materials since 1984, and also upload videos elaborating the application of their products. 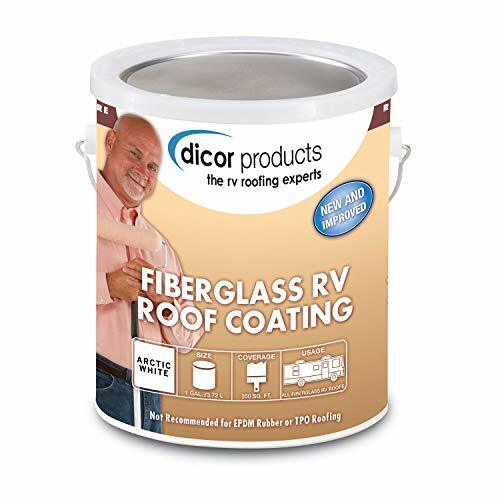 Dicor RPFRC1 Fiberglass RV roof coating is a coating specifically designed for fiberglass roofs. It comes in white color. It comes in a 1-gallon can and provides coverage of 350 sq ft. the item weighs 9.7 pounds. It is not recommended to use this coating on an EPDM or rubber roof. Kool Seal was introduced as a brand in 1920. It has been since then manufacturing roof coatings in diverse varieties. KST coatings is an elastomeric roof coating that comes with a 10-year warranty. It comes in a 4.7-gallon bucket and provides a coverage area of 380-475 sq ft when applied to a metal roof. When applied to a concrete roof it covers approximately 225 sq ft. it comes in white color. The product provides protection against moisture, fluctuating temperature, mildew, and algae. 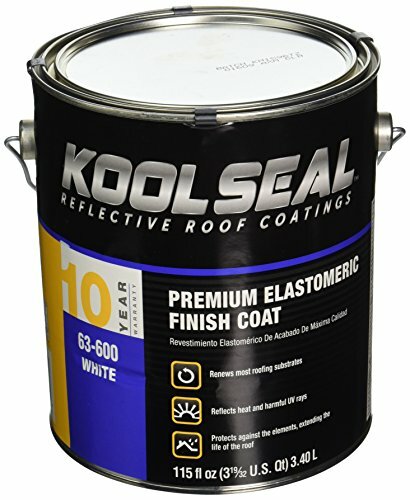 Kool Seal specializes in manufacturing seals and coatings that are highly reflective and provide good insulation. They have been in this business since 1920. Kool Seal KST063600-16 Elastomeric roof coating comes in a 3.40 L can. It contains 115 fluid ounce of liquid. It comes in white color and is compatible with most substrate roof materials. The product comes with a 10-year warranty. It provides protection against mildew, algae, and moisture. The product provides excellent adhesion in all kinds of temperatures. Liquid Rubber was established in the early 2000s. Their products are manufactured in North America and distributed globally. 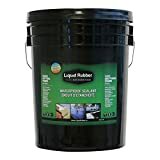 Liquid Rubber waterproof coating is available in two sizes of 1 gallon and 5-gallon cans. Both these sizes are available in black color. It bonds to almost any surface and is resistant to chemical and UV rays. The membrane is highly flexible. The product provides a coverage area of 50 sq ft/ G per coat, and 3-4 coats will result in a 60-80 mil thick membrane. When applied on vertical surfaces it provides coverage of 100 sq ft/ G per coat. It is made of polymer and weighs 44 pounds. It typically cures between 24-48 hours. Rubberseal has been manufacturing and producing coatings for different surfaces for over 20 years. 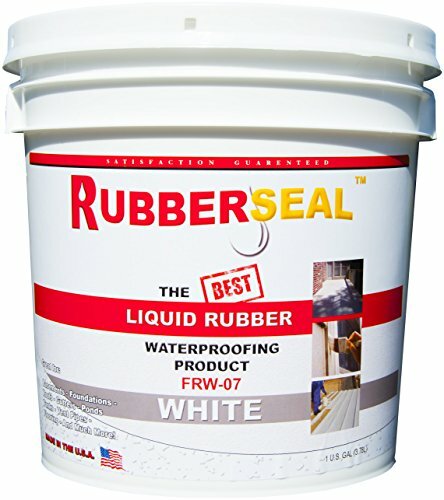 Rubberseal Liquid Rubber Waterproofing and Protective coating come in a 1 gallon can and in white color. It is also available in different sizes of 2 gallons, 5 gallons, 32 ounces, and 16 ounces. It has a spread rate of 60 sq ft/ G at 20 imperial mils. It is highly reflective and elastic. The product provides resistance against chemicals, heat, and puncture. It weighs 5.4 pounds. RV Roof coating is integral to the protection and maintenance of your RV. roof coatings are made of various substances and can be acrylic, urethane, and silicone based. The decision to choose one coating over the other is influenced by various factors including durability, elasticity, price, reflectability, elasticity, and weather conditions among others.